I am like most of you and have given myself a very strict New Years resolution through the month of January. I am currently counting the days down until January is over and am wondering why I picked a month that has 31 freakin days in it!!! NOTE TO SELF: next year pick February. I have been working hard at eating healthy and this month I want to share with you one of my success secrets…..Mediterranean food! Put on the toga and go Greek for your healthy eating with flavor packed food. I love Greek food because you can eat it hot or cold. I have been making myself healthy bowls that I take on the go and to work and it really helps with my cravings and gives me the nutrition my body deserves. 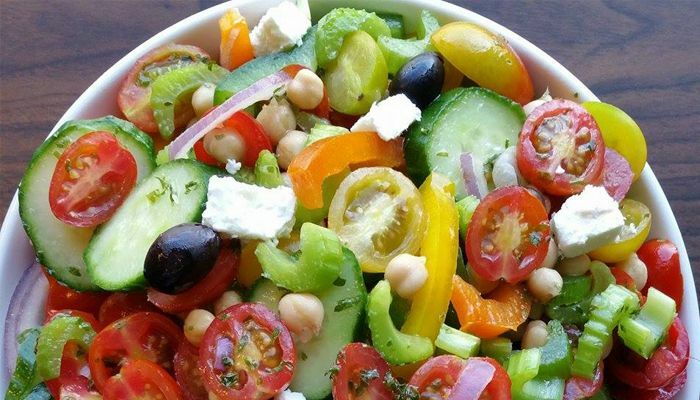 Here is my Greek veggie salad for you to try one day. In a large mixing bowl add the cucumbers, tomatoes, olives, asparagus, celery, mint, and chicken breast. Toss with salt, lemon juice and sesame seeds and let sit. In the bottom of your bowl or plate spoon in the tahini or hummus to one side. Then put the salad to the other. Chef’s Note: This bowl is good for 2-3 days in your fridge.